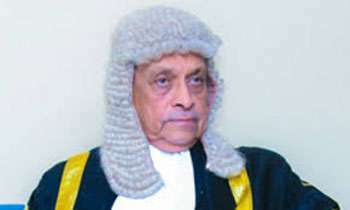 The Speaker Karu Jayasuriya had agreed to provide parliamentary privileges to newly appointed Prime minister Mahinda Rajapaksa including the Premier’s chair in Parliament chambers. A spokesman from Speaker’s office said he has to do it as per the gazette notification issued pertaining to the appointment of Mr. Rajapaksa as the Premier. Speaking to the Daily Mirror UPFA MP Thilanga Sumathipala the Prime Minister was not appointed by the Parliament but by President Maithripala Sirisena. WORLD RECORD ....... FORMER PRESIDENT IS GOING TO SIT ON PM'S CHAIR. Sorry no Putin did it when Dmitry Medvedev was made president of Russia. Obviously constitution will be changed for MR to become king again. And t Speaker has no 'say'!!!!!! For Rajapakse this is entirely normal garbing other position, property etc. Let the PM be chosen by the vote of the MPs in parliament. No need of constitution Mr. Shan? lol do you even realize that it is against the current constitution? Or is Ranil more important than the law? Thanks giving for the previous 200 million payment . Politicians will sit on any chair, even the Peon's, if it gives them power and money. Same old kitchen Lanka will move backwards.All assets could not be robbed will be fully wiped out this time. Wake up Lankans decide do you still want to cast your votes for these thieves? RW appointed by the same way. When he was appointed as PM he had only 42 seats. What is wrong with MR' s appointment.? The old man is finally starting to realize that he is not a supreme court judge and it's not his job to interpret the constitution. Your impartiality as the speaker is highly controversal. Why MR is getting PM chair? Because the executive president of the country appointed him. UNP did this to themselves when they fielded a candidate from the other camp.